If you have found my site because you want to know more about busking in NYC, take a look around the pages as there is a lot of helpful information. On this site I also have a vast collection of videos I created called The Inspiration Project. Created from my years filming people in stations and asking them a simple yet complex question. Follow links within this site for videos and stories. There are many things that I am doing in Sturgeon Bay and in Wisconsin. I currently host a Writers Night with pAt mAdonald. Here is an article about it written by Alyssa Skiba and photo by Len Villano. it's that time of year again to audition for the Music Under New York Program. Applications must be in by March 24th. This is a once a year event. Submissions must be completed by midnight on Friday, March 24, 2017. NOTE: you do not have to be in this program to legally busk in NYC. You need to be informed of the simple to follow rules of condct. Please check out my page Busker Info In NYC to get useful information on busking in NYC. I set out on a journey last September to travel around the country. 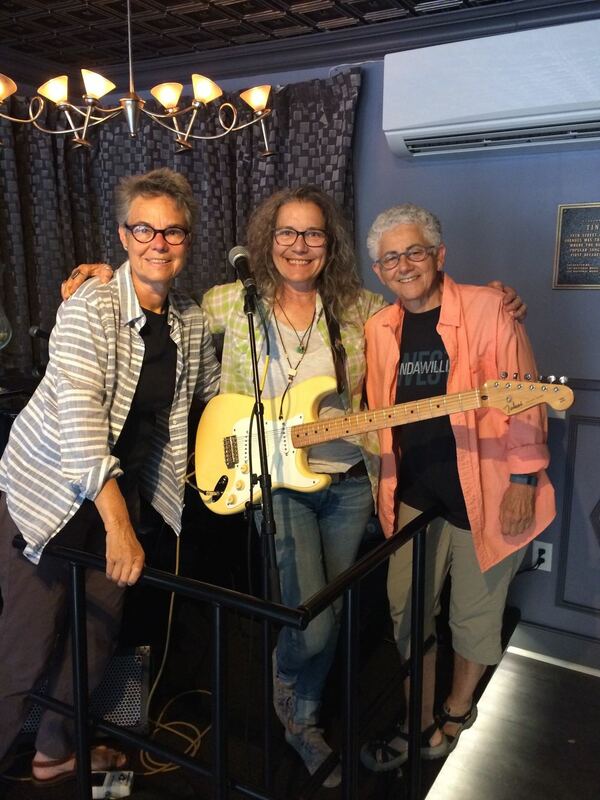 When I arrived on Cape Cod in May, a chance singing with amazing artist Zoe Lewis got the owner's of Tin Pan Alley to invite me to return for a gig that would last me the entire summer. Here I am with my poodles, settled in for a great summer. Certainly it's a far cry from the chaos of the subway, but if you've ever been on Commercial Street in the summer you might think there isn't much difference! I love that the name of the bar/restaurant is Tin Pan Alley made famous as the place where an entire generation of music was written right in the heart of Manhattan. Hope to see you if you find yourself in Provincetown this summer. If you have been following my social media posts, you know I am currently on a road trip (I call the Wander Tour) around the USA. I left NY on September 23rd (my grandmother's birthday and the first day of Autumn). I headed west from Old Chatham, NY to Erie, Pa. and then onward stopping in Detroit, Grosse Pointe where I had the pleasure of performing with my partner in the 80's Lenore Troia. We hadn't performed together for over 2O years and it was a wonderful reunion. I traveled north in MI to Torch Lake, where I connected with long time musical friend from the days that I lived in Key West, Fl, Leanna Collins. Leanna is an amazing musician and songwriter, happily still performing. she and her husband have a wonderful cafe, performance space. Then I traveled onward to Holland, MI,where a new friend provided the poodles and me with a comfortable home, fresh bread, met a loving neighbor, and a fun visit to a Mom in independent living. Thankful for laundry, we headed off to Sioux Falls, SD, where I found new friends of the the owners of a restaurant Parker's Bistro, who then invited me to perform the next night, which I happily stayed around to do. I found myself after my performance joining in on a hysterical Karaoke trip with new friends with poodles joining along..
As part of the New York City busking community, I am keenly aware of the importance of live music and art in public spaces. Most people seem confused whether it is legal to perform in the subway. There is a conflicting belief that you can only perform if you are in the Music Under NY Program. But actually there is a legal precedent giving the right to perform. In 1985 a court case People v. Manning gave performers the constitutional protection for their artistic performances in New York City. I will be performing with other buskers. Would love to see you there and get a chance to see buskers having a chance to perform on stage to an audience that isn’t rushing past!! Thanks to Council Member Robert Cornegy, Jr for his support. BuskNY has a crowdfunding campaign to help fund the Busking at 30 event. Please consider donating. The work that BuskNY does, ensures that the rights of buskers are being served 365 days a year. Your support means a lot. I always bring my portable H4N to record my performances. I use mostly for my own archives. Since I'm taking a break I thought you'd enjoy hearing this performance of mine at Tara Hill Tavern. thanks to Sid Moskowitz for putting together these gigs. Tara Hill Tavern April 28, 2015 Here is the list of songs I performed, including a fun spontaneous jam with accordionist Curtis Becraft, on my song Easy come Easy Go. I met Gay in Paris where I was living in the early 1990's. We wrote music together. Gay went on to perform in some amazing one woman show's singing music of Brel and Piaf. She's performed in Cat's and toured with La Cage Aux Folles. I am so excited to be performing a few songs with Gay at the series Thank God It's Monday. We'll be singing a few Phil Ochs songs (his music important now more than ever), and of course the Indigo Girls song Closer to Fine that we sang together at Joe's Pub recently. Mostly you have to come and hear Gay's amazing voice and stage presence. Hope to see you there. It's free!! The application deadline for the annual MUNY auditions is now closed for 2015. Tuesday, May 19th, 2015 the Metropolitan Transportation Authority’s MUSIC UNDER NEW YORK (MTA/MUSIC) program will hold its twenty-eighth annual Auditions in Grand Central Terminal’s Vanderbilt Hall. MUSIC UNDER NEW YORK is one of many visual and performing arts programs managed by the MTA’s Arts & Design office. MTA/MUSIC schedules over 7,500 concerts annually in 31 subway and rail stations around New York. MTA/MUSIC performers, selected through the annual Auditions, are among New York’s most talented musicians.